I have a new top one favorite breakfast dish which I am happy to share here on my blog. 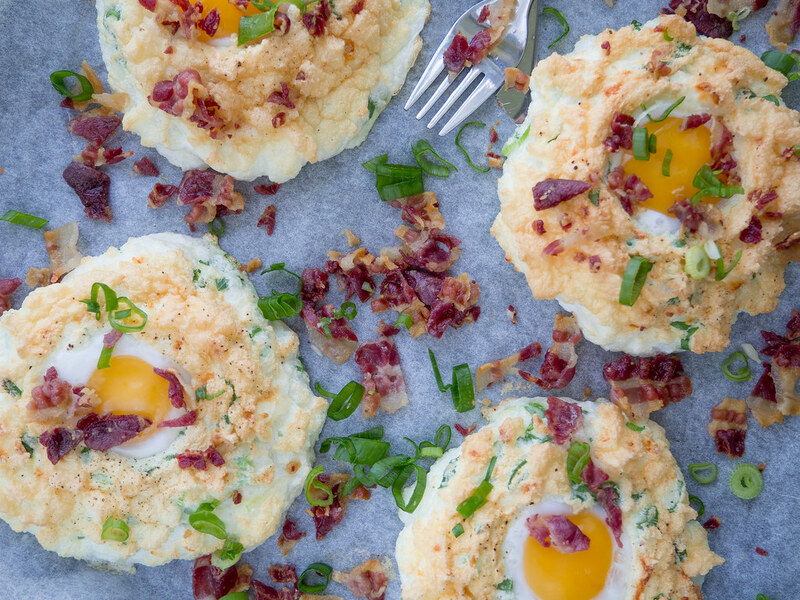 These cloudy eggs with chopped bacon and chives are just fantastic if you ask me. 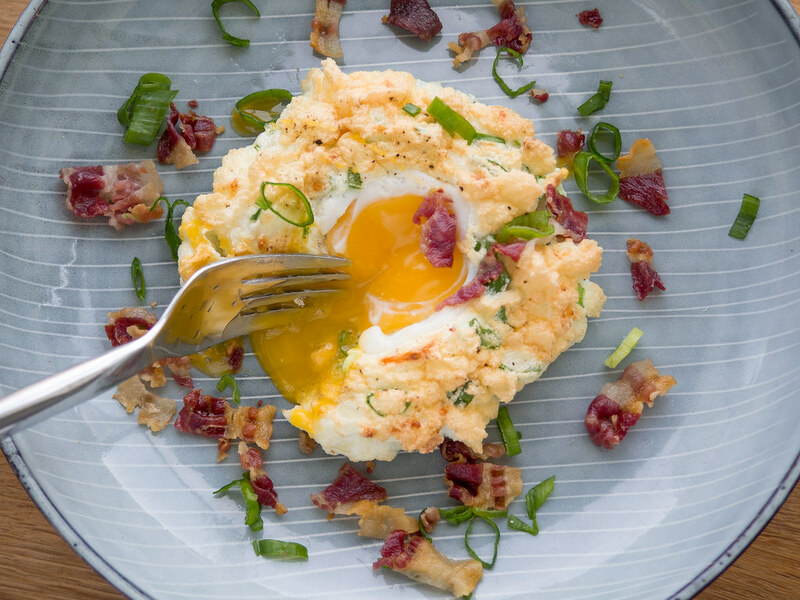 It had never crossed my mind that it was possible to make breakfast eggs in other variations than scrambled, omelet, fried and cooked – I was wrong. 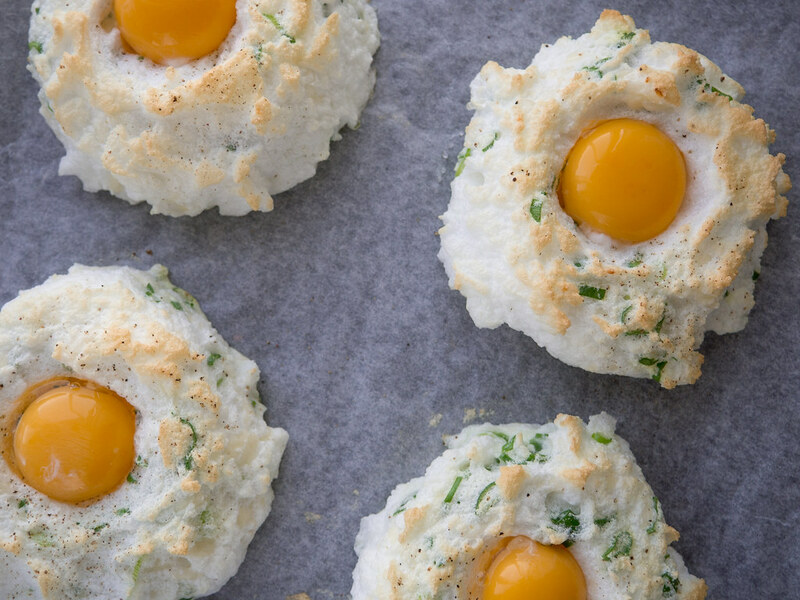 Today, my favorite way of serving my weekend morning’s eggs are as these cloudy eggs. 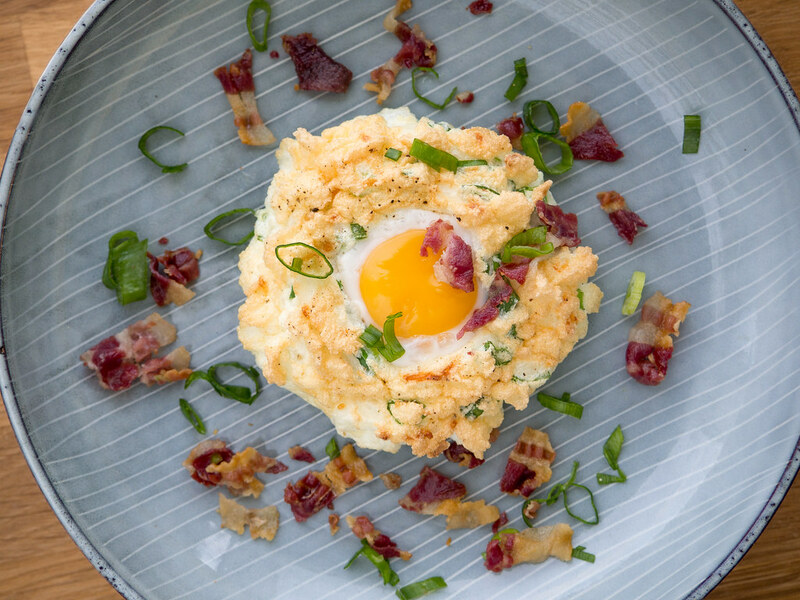 Together with the chopped crisp bacon, chives and grated cheese these eggs are super great and tasteful. Besides being tasteful, they looks good too. They actually looks professional and like something, that requires good and advanced cooking skill. However, this is absolutely not true. 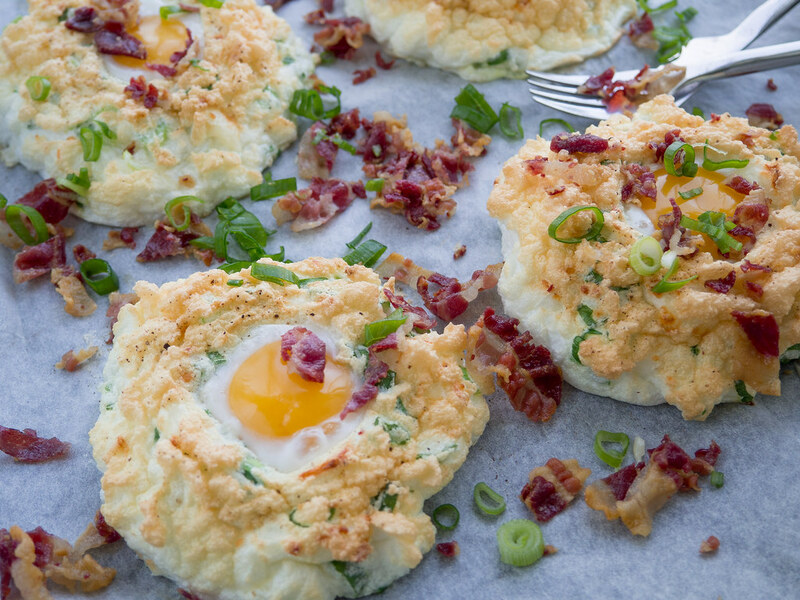 There are just a few things that you need to master and then you can easily make these beautiful and homemade cloudy breakfast eggs. These cloudy eggs goes great alone and as they are. However, they are also perfect as a part of a brunch dish with toasted bread, cheese, orange juice, apple slices and similar. I personally think that the best part of these eggs is the smiling egg yolk in the middle of the fluffy and stiff egg whites. By cooking the eggs the exact amount of time in the oven you keep the yolks liquid and the whites stiff – so delicious. As said earlier, it is actually really easy to make these cloudy eggs even though they look quite advanced. You start by separating the egg whites and the egg yolks. 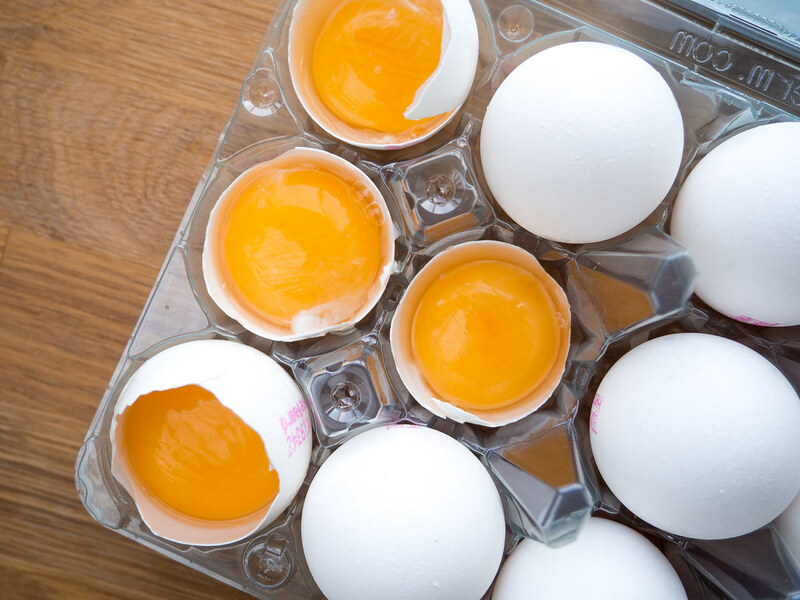 Transfer the whites to a large bowl and keep the yolks intact in the cracked eggshells. 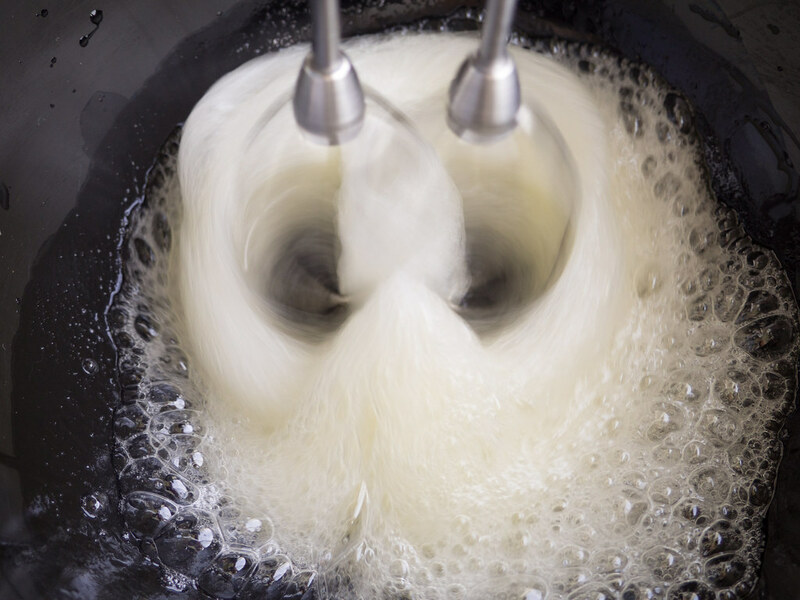 Now whisk the whites until they become fluffy and stiff. They are done when you are able to flip the bowl upside-down while avoiding the whites running out. Add the chopped chives and grated cheese and gently mix the ingredients together. 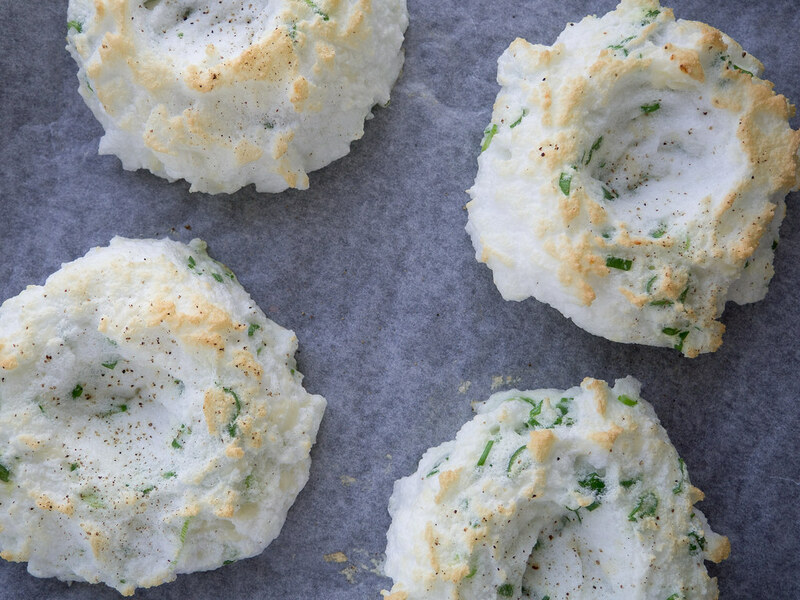 Spoon the whites onto a parchment paper covered oven plate and create four small mounds. Make a small indentation in the middle of the mounds. Sprinkle the whites with salt and freshly ground pepper. Bake the whites for 3 minutes at 230 C (450 F). Add the yolks in the indentation in the whites and bake them for another 3 minutes. 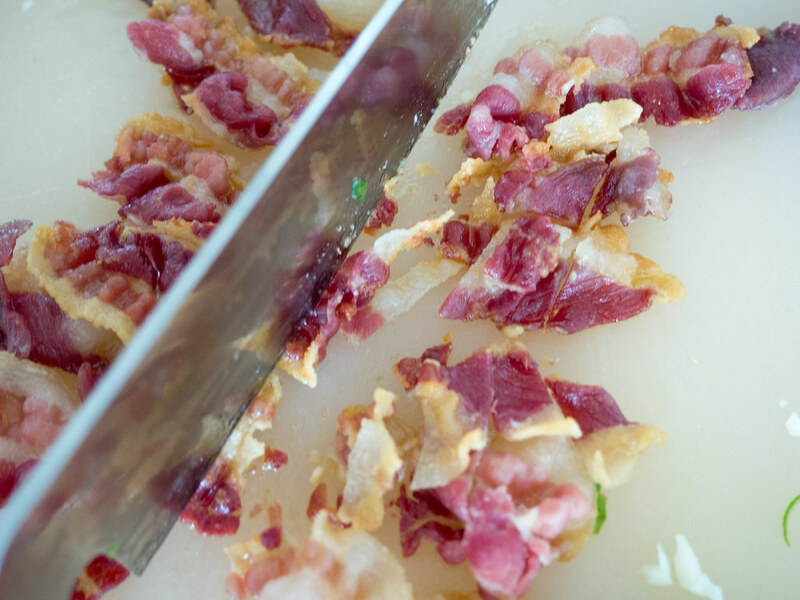 When done, sprinkle the cloudy eggs with fried and chopped bacon and chopped chives. Serve right away. 1. Separate the egg whites from the egg yolks. Makes sure not to break the yolks. You can keep the egg yolks in the cracked eggshells while preparing the other ingredients. 2. 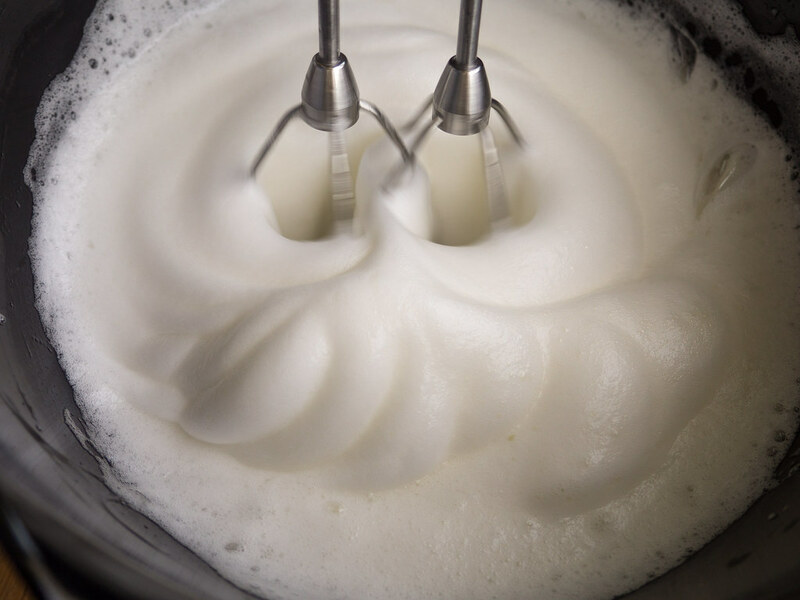 Using a hand mixer/stand mixer; beat the whites into a fluffy and stiff form. You should be able to turn the bowl upside down. 3. 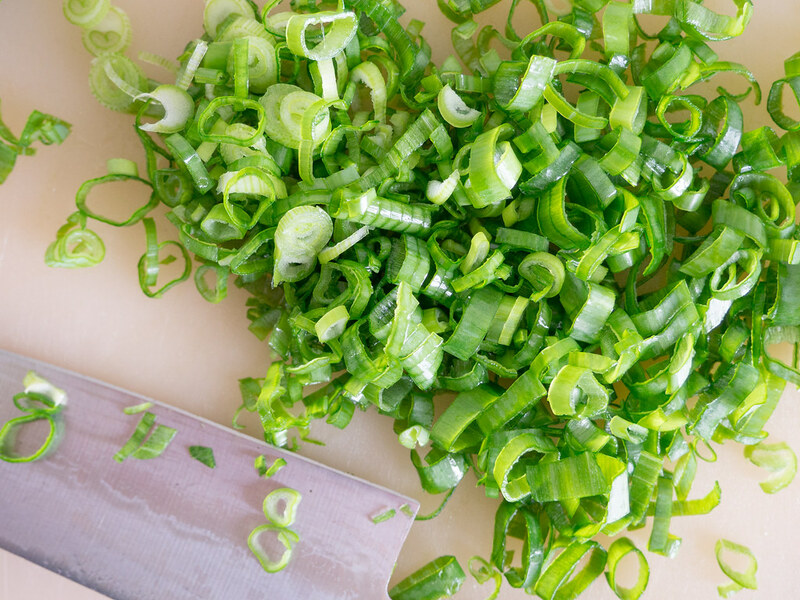 Gently add and mix the grated cheese and chopped green onions with the beaten whites. 4. 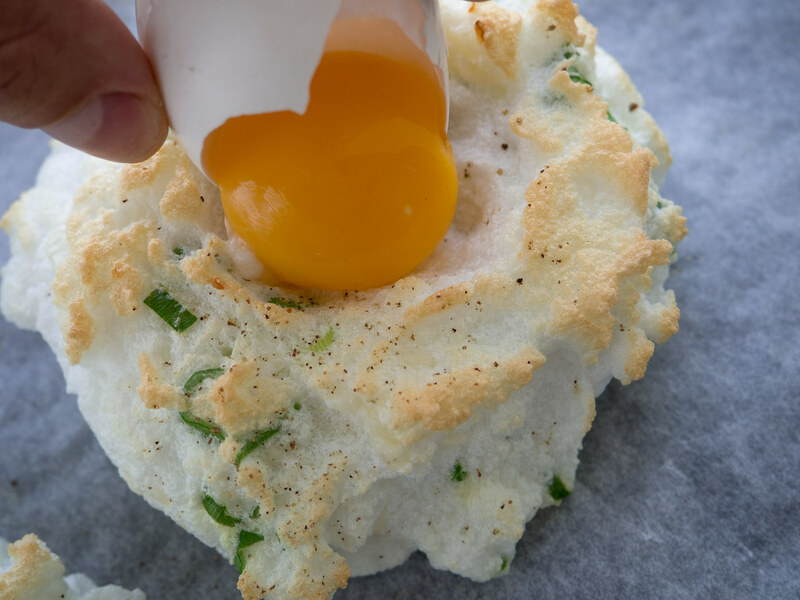 On a parchment paper covered oven plate, spoon the egg white mixture into four circular mounds with a small hole in the middle. 5. Season the egg whites with a little salt and pepper. 6. 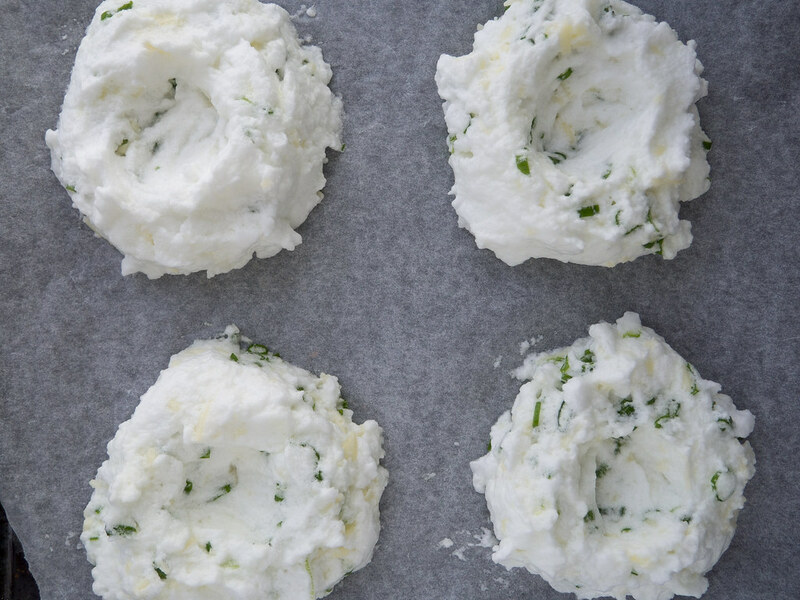 In a 230 C (450 F) preheated oven, prebake the egg whites for 3 minutes. 7. Now gently transfer one egg yolk to the middle of each egg white mound. 8. Bake the whites with the yolks for another 3 minutes. 9. 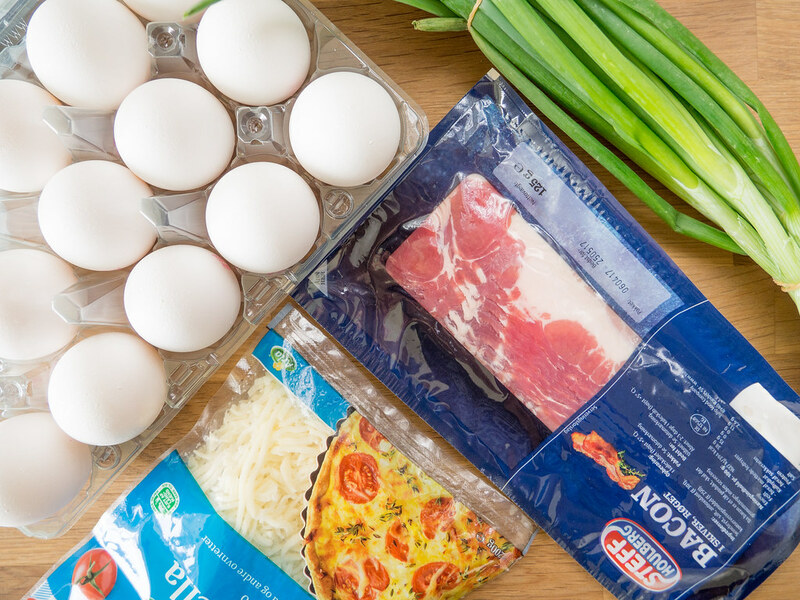 When done, sprinkle the fluffy eggs with chopped bacon and green onions. Serve right away.